DAY 12 -- Friday was our last official contract day at work -- a few meetings and some time in my office. One office day left on Tuesday and the gates will open wide for the official Summer of Tim to get underway! The kids went to stay with my brother and sister-in-law tonight as a group birthday present to all three. 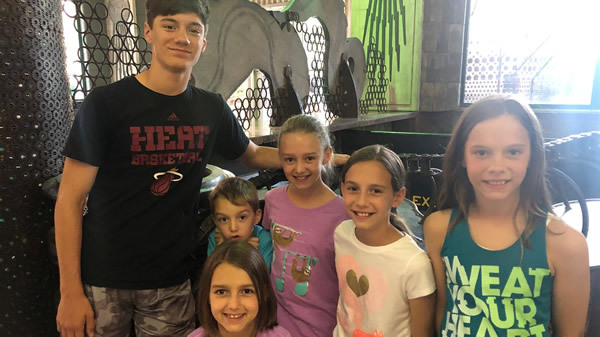 They've got plans to hit up the City Museum in St. Louis -- with six kids and two adults. As a self-proclaimed claustrophobic, I hate that place. The big topic from Friday came from an occurrence at a Noblesville, Indiana school that took place about the time we were recognizing our districts retirees here at my own school. This one was apparently stopped by a seventh grade science teacher named Jason Seaman -- a graduate of the school where I've worked for the past fifteen years. I didn't know Jason when he was in high school as he wasn't one of my students I worked with directly. Still, I knew of him and this incident in Noblesville has hit a little close to home. Jason took a few bullets to save the lives of his students and prevent what could have been a much worse situation. While I'm proud of Jason, I have to ask, why do I even have to use the phrase "could have been a much worse situation" when I'm talking about a middle school science classroom?!?! For crying out loud, when is enough enough? This is not a mental health issue. This is not an issue of the constitutional rights. This is a gun issue. Plain and simple. Any opinions to the contrary you can keep to yourself. Don't waste the effort. You won't convince me otherwise. DAY 13 -- With the kids staying with my brother and his family, Amy and I headed to Kickapoo for a night of unplugged solitude. Sure it was hotter than deep fried hell, but the time away from our phones, and jobs, and responsibilities was exactly what we needed. I read about ten pages of the book I've been in lately. Amy read about ten books. I mostly sat and listened to music all afternoon while I made up stories about the people around us at other campsites. There was the couple to our right -- they were on their honeymoon. Newlyweds looking to save some money on an elaborate trip by taking their fluffy dog camping for the weekend to celebrate their recent nuptials. The couple next to them was comprised of a deeply religious young man on a camping trip and his adventurous girlfriend who wanted to work on her tan. Religious guy's dad and brother joined them later in the evening for a s'mores and a campfire devotion. Next to them was a large group of Europeans on a nation-wide tour of mountain bike trails in the U.S. They felt they had been misled by spending a night at a park outside Danville, Illinois and decided to get crazy drunk instead of biking the trails. As for Amy and me, we cooked up an amazing skillet of vegetables over the fire and solved the world's problems over a bottle of Fireball around the campfire. DAY 14 -- After a wonderful night's sleep under the open sky of the campsite, I found myself out of the tent by 6AM with bacon and eggs cooking over the fire by 7. The sun was hot by eight so we packed up and headed home. After picking up the kids early in the afternoon, we spent the rest of the day just being lazy. The kids were wiped. We were tired. We were content to be lazy. I did make the mistake of watching Game 7 between the Cavs and Celtics. I was really pulling for that young Celtics team and against Brond making his eighth straight appearance in the NBA finals. But the basketball gods were not on my side. Here's to hoping the Cavs get destroyed in the finals. DAY 15 - Memorial Day. Gratitude for the freedom to enjoy all of these.